Our evidence-based analysis on creatine features 35 unique references to scientific papers. As with most things in nutrition, there’s no simple answer. Your individual needs will depend on your health, body composition, main goal, and level of physical activity (type, intensity, and duration). And even taking all this into account, you’ll end up with a starting number, which you’ll need to adjust through self-experimentation. Daily requirements are expressed in grams of protein, either per kilogram of body weight (g/kg) or per pound of body weight (g/lb). In this article, we’ll only mention daily requirements for adults. If you’re of healthy weight, active, and wish to lose fat, aim for 2.2–3.3 g/kg (1.00–1.50 g/lb), skewing toward the higher end of this range as you become leaner or if you increase your caloric deficit (hypocaloric diet). Most studies have looked at dosages up to 1.5 g/kg; only a few have looked at dosages as high as 2.2–3.3 g/kg. However, even those higher dosages don’t seem to have negative effects in healthy people. 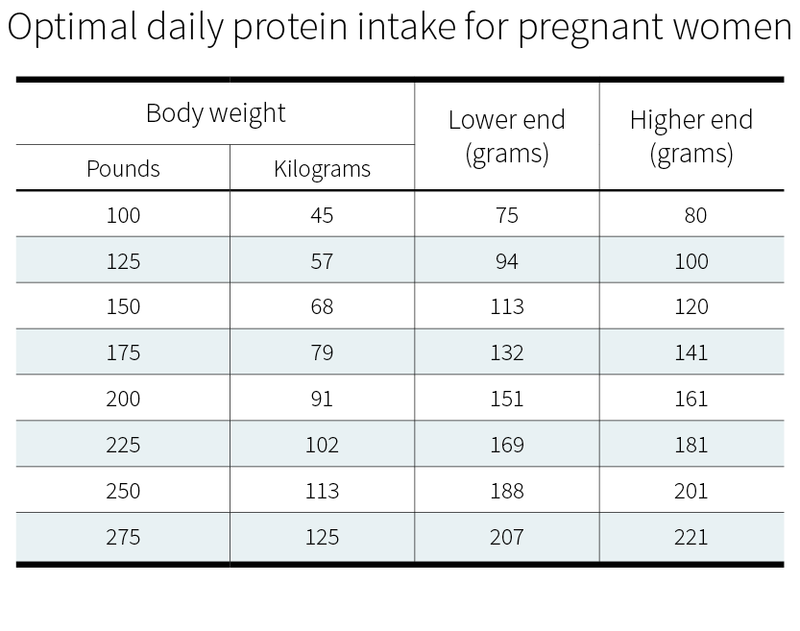 How much protein you need depends on several factors, such as your weight, your goal (weight maintenance, muscle gain, or fat loss), your being physically active or not, and even whether you’re pregnant or not. The U.S. Recommended Dietary Allowance (RDA) for protein is 0.8 g/kg. This is considered to be the minimal amount of protein a healthy adult must consume daily to prevent muscle wasting when total caloric intake is sufficient. According to recent studies, however, the RDA for protein may not be sufficient for healthy young men, older men, or older women. These studies point to 1.2 g/kg as the minimum intake before the body starts downregulating important non-essential processes, from immune function to muscle protein synthesis. Even a reanalysis of the data used to establish the RDA suggests the minimum intake should be at least 1.0 g/kg. Each diet was equally hypercaloric: each participant consumed 40% more calories than they needed to maintain their weight. 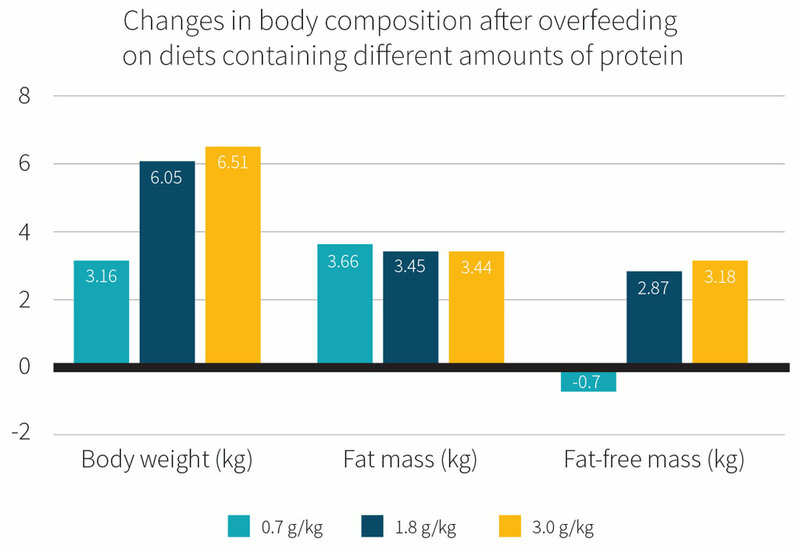 Yet, as shown in the figure below, eating near the RDA for protein resulted in loss of lean mass, and while this loss is so small as to be nonsignificant, the higher protein intakes were associated with increases in lean mass. Another takeaway from this study is that eating more than 1.8 g/kg doesn’t seem to benefit body composition, which makes it a good higher end for your daily protein intake, provided that you aren’t physically active or trying to lose weight. The RDA for protein (0.8 g/kg) underestimates the needs of a healthy, sedentary adult, who should rather aim for 1.2–1.8 g/kg (0.54–0.82 g/lb). 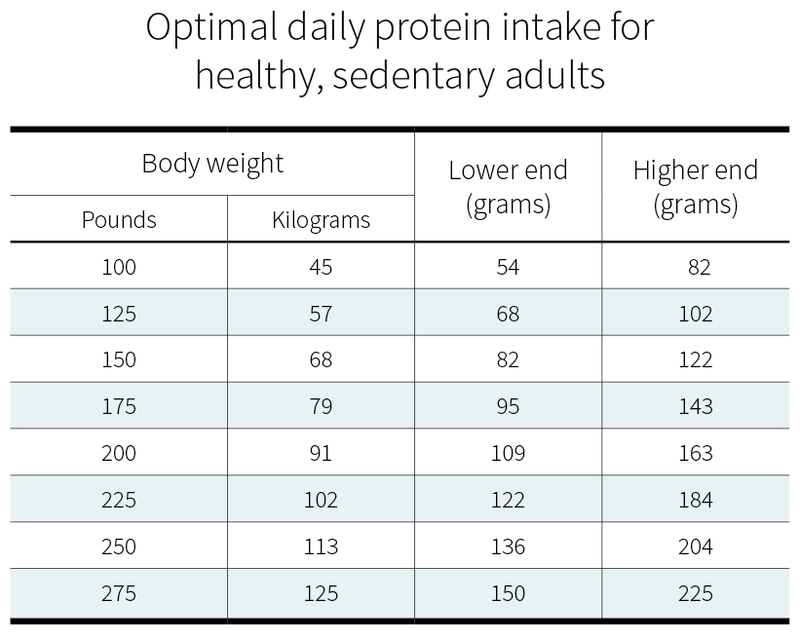 If you’re physically very active, you need more protein daily than if you were sedentary. The American College of Sports Medicine, the Academy of Nutrition and Dietetics, and the Dietitians of Canada recommend 1.2–2.0 g/kg to optimize recovery from training and to promote the growth and maintenance of lean mass when caloric intake is sufficient. This recommendation is similar to that of the International Society of Sports Nutrition (1.4–2.0 g/kg). Importantly, it may be better to aim for the higher end of the above ranges. According to the most comprehensive meta-analysis to date on the effects of protein supplementation on muscle mass and strength, the average amount of protein required to maximize lean mass is about 1.6 g/kg, and some people need upwards of 2.2 g/kg. For those interested in a comprehensive breakdown of this study, please refer to our Examine.com Research Digest, Issue 34, Volume 1. However, only 4 of the 49 included studies were conducted in people with resistance training experience (the other 45 were in newbies). There’s some evidence that female athletes require 1.4–1.7 g/kg, and that amateur bodybuilders require 1.7–2.2 g/kg on their non-training days. Since higher protein intakes seem to have no negative effects in healthy people, one may want to err toward the higher amounts. The daily protein requirement of healthy, sedentary adults is only 1.2–1.8 g/kg (0.54–0.73 g/lb), but regularly active adults and athletes need more. You can optimize body composition, performance, and recovery by consuming 1.4–2.2 g/kg (0.64–1.00 g/lb) — preferably toward the end of this range. Resistance training, such as lifting weights, is of course required for muscle gain: you can’t just feed your muscles what they need to grow; you also need to give them a reason to grow. Assuming progressive resistance overload and a mild hypercaloric diet (370–800 kcal above maintenance), a few studies suggest you’ll gain less fat if you eat more protein (3.3 g/kg rather than 1.8–2.6 g/kg). 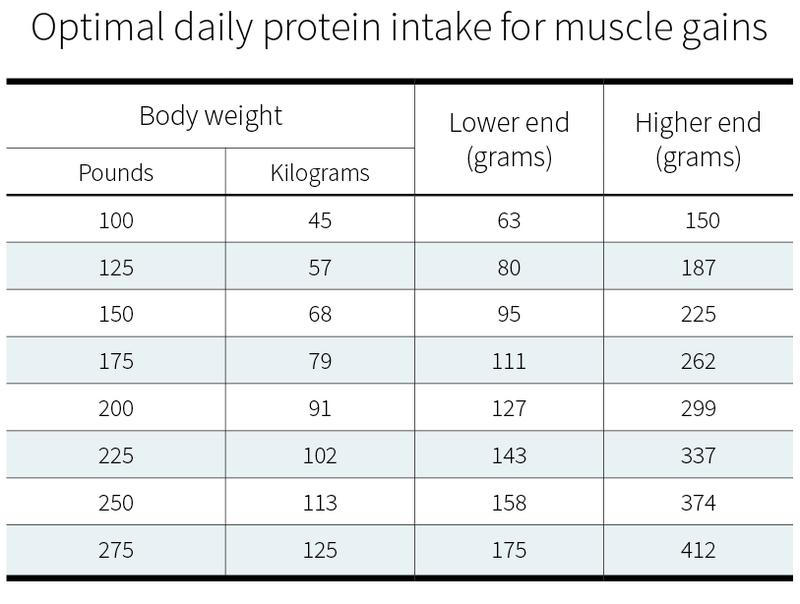 What’s important to understand is that a daily protein intake of 3.3 g/kg isn’t likely to help you build more muscle than a daily protein intake of 1.8–2.6 g/kg. What the higher number can do is help you minimize the fat gains you’ll most likely experience if you eat above maintenance in order to gain (muscle) weight. Athletes and active adults can minimize fat gain when overfeeding by increasing protein intake to upward of 3.3 g/kg (1.5 g/lb). More protein helps preserve lean mass in dieters, especially lean dieters. An early review concluded that, to optimize body composition, dieting athletes should consume 1.8–2.7 g/kg. Later studies have argued that, to minimize lean-mass loss, dieting athletes should consume 2.3–3.1 g/kg (closer to the higher end of the range as leanness and caloric deficit increase). This latter recommendation has been upheld by the International Society of Sports Nutrition and by a review article on bodybuilding contest preparation. Note that those recommendations are for people who are relatively lean already. 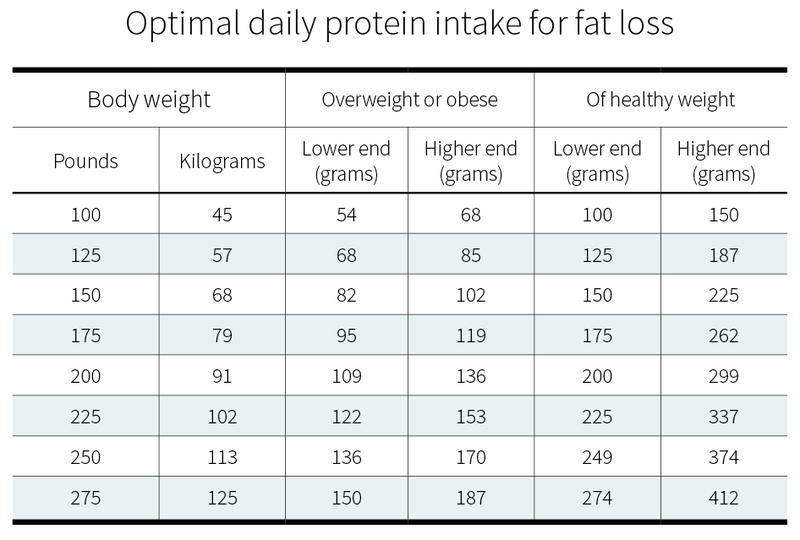 Several meta-analyses involving people with overweightness or obesity suggest that 1.2–1.5 g/kg is an appropriate daily protein intake range to maximize fat loss. This range is supported by the European Association for the Study of Obesity, who recommend up to 1.5 g/kg for elderly adults with obesity. It is important to realize that this range is based on actual body weight, not on lean mass or ideal body weight. 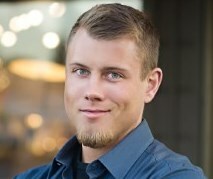 Considering the health risks associated with overweightness and obesity, it is also noteworthy that eating a diet higher in protein (27% vs. 18% of calories) significantly reduces several cardiometabolic risk factors, including waist circumference, blood pressure, triglycerides, and fasting insulin, while also increasing HDL-C and satiety. These effects are small, however, and likely dependent on the amount of body fat one loses. When dieting for fat loss, athletes and other active adults who are already lean may maximize fat loss and muscle retention by increasing protein intake to 2.3–3.1 g/kg (1.00–1.41 g/lb). People who are overweight or obese are best served by consuming 1.2–1.5 g/kg (0.54–0.68 g/lb). Importantly, these values were determined from sedentary women, meaning that pregnant women who engage in regular physical activity may need even higher amounts. Pregnant women may require a daily protein intake of 1.7 g/kg (0.77 g/lb) to support both the fetus and themselves. Protein supplementation during pregnancy appears to lower some risks for the baby — including the risk of stillbirth. How much protein do I need per meal? These values are derived from studies using whey protein, which is especially bioavailable and rich in essential amino acids (EAAs). If your protein of choice isn’t as bioavailable or as rich in EAAs — especially leucine — you’ll need a higher dose. Your dose should be even higher if consumed through a meal. 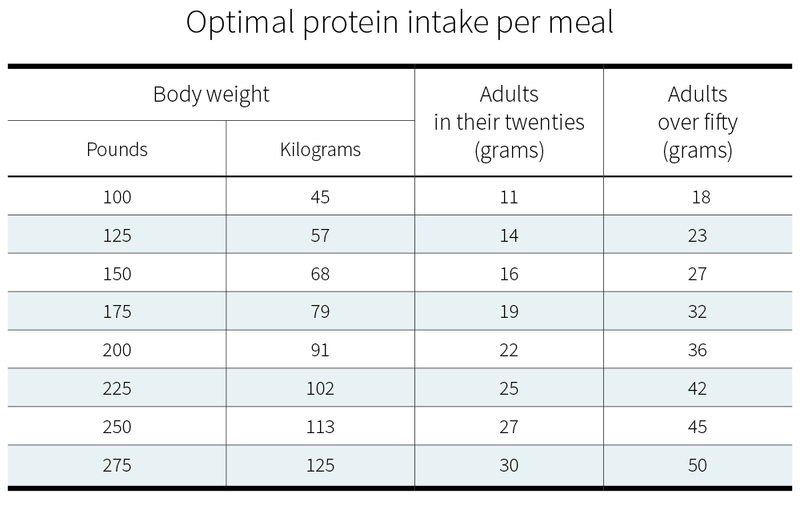 While 70 g (of protein consumed in one meal) may not increase protein synthesis more than 40 g does, it can further reduce body-protein breakdown, resulting in greater net protein balance. The problem with this study is that it looked at whole-body-protein balance. Muscle tissue accounts for only 25–30% of whole-body-protein turnover, meaning that eating more protein may not necessarily translate to greater muscle-protein turnover and growth. Still, these studies show that the additional protein is not “wasted” (a common myth). From a pragmatic perspective, it seems prudent to treat 0.24 g/kg (adults in their twenties) and 0.4 g/kg (adults over fifty) as minimum doses per meal, to be exceeded as necessary. This fits the conclusion from a recent review article on the maximal amount of protein that can be used from a single meal. The authors suggest that, to maximize lean body mass, active adults should consume 1.6–2.2 g/kg per day, spread across four meals (0.40–0.55 g/kg per meal). 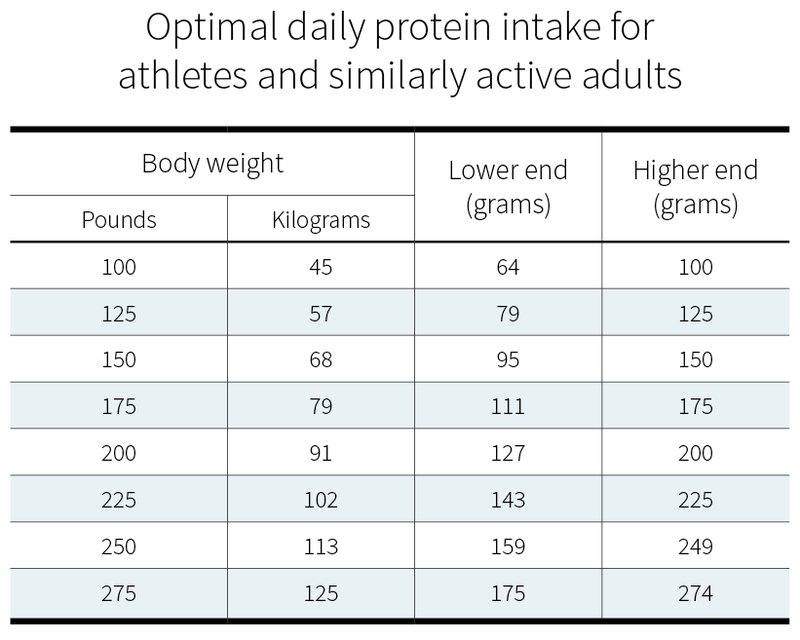 According to this table, a young 175-pound athlete needs to consume only 19 g per meal. But, as shown in the “Daily protein intake for athletes and other active adults” table, he could benefit from as much as 175 g per day — which translates as nine meals per day! Constantly sipping on a protein shake is an option, but maybe not an optimal one, since the body gets desensitized to the anabolic signaling of protein when intake is too frequent. More realistically, our young 175-pound athlete will simply consume more than 19 g of protein per meal. For maximal stimulation of muscle protein synthesis, the per-meal dose of quality protein (such as can be found in meat, eggs, and dairy) is at least 0.24 g/kg for adults in their twenties and 0.40 g/kg for adults over fifty. Higher doses will not be wasted and are probably necessary when eating mixed meals that contain a variety of protein sources. If you're looking into protein to maximize your muscle gains, check out out our Muscle Gain & Exercise Performance Supplement Guide. If you're looking to get fit, then our Fitness Guide (which contains our Muscle Gain & Exercise Performance Supplement Guide) is a no-brainer for science-based information on how to increase your fitness. For more information, see our expansive page on whey protein, which takes a science-based analysis at it's benefits, side effects, the correct dosage, and more. If you're looking to level up your fitness, then check out our Fitness Guide.